Set your calendars… v3.0 is releasing on Tuesday, April 30th. Apocaloctopus here with some exciting news: Patch 3.0 is nearing completion! Every week we’ll be posting a new devlog with more brand new details, images, and information about the new patch. But that’s not all. In the next couple of weeks, we’ll be doing another Game Hive Livestream with the Tap Titans 2 lead to talk more about the patch (and take questions from players!). Make sure you tune into the Livestream because we’ll also be announcing the OFFICIAL RELEASE DATE for patch 3.0! Titan Lords now come in different shapes and sizes. The individual parts can now be targeted while you are attacking – and the HP in each part can vary from one Titan Lord to the next! To defeat a Titan Lord, you must deplete its Total HP, which is displayed at the top of the attack preview and attack screens. Individual parts can be destroyed as each has their own HP! Body: Deal enough damage to the body to deplete the Titan Lord’s total HP and it will be defeated. Armor: Some powerful Titan Lords are equipped with armored parts. You can deal damage to armor to destroy it, but pay close attention: some cards specialize in destroying armor while others are best against the body! Skeleton: The Titan Lord also has an underlying skeleton layer which is revealed as its armor and body parts are destroyed. The Skeleton takes significantly reduced damage from all attacks and Raid Card will not activate when you are attacking the skeleton, so instead of targeting a skeleton part, you should focus attacks on the parts with HP remaining! 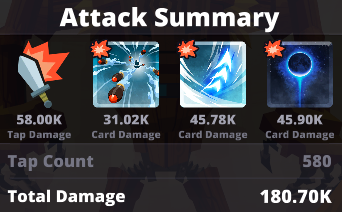 Support Cards can grant you bonus damage and effects! Discover powerful synergies between cards to deal the best damage in different conditions: make a deck specializing in destroying Titan Lord Armor, or one for spreading out your damage to all parts, or one for finishing off a Titan Lord that is almost destroyed! 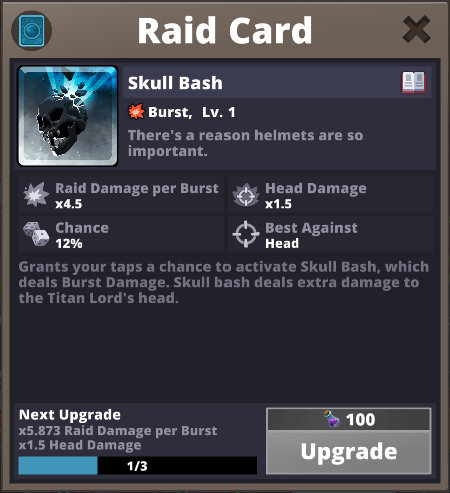 Each Raid Card can get more powerful as they advance in levels. You can level up a Card by collecting duplicates, and by using the new card currency: Dust! Before attacking a Titan Lord, select a deck of up to 3 of your Raid Cards to contribute to the damage you deal in your attack. Try to figure out the most powerful combinations of Raid Cards — and the right opportunities to attack with them! When a raid starts, each participant can do a few 30-second attacks against the Titan Lord. After a Raid Card is used in an attack it is exhausted, which means it cannot be used again until the next attack cycle. Once the cycle resets you can do more attacks and use your previously exhausted Raid Cards! Note: This means that you could do your attacks right at the start of the first attack window, then do more attacks at the end of the second attack window – without missing out on any attacks! No more alarm on your phone every 6 hours! Raid tickets are collected by the clan and used to start Clan Raids. Each clan member can earn raid tickets for the clan by completing daily achievements. Note: Leaving a clan at any point will forfeit all tickets earned for that day! No more clan hoppers! Completing a raid will earn Clan XP for the clan and each participating player will get Raid Cards, Hero Scrolls, and Dust! And so, for those of you who have been playing TT2 and having fun (or anxiously waiting for new features and content! ): THANK YOU! We can’t wait to share Tap Titans 2 v3.0 with you. Here’s a peek at a new Titan Lord you’ll be spending a lot of time with in 3.0: Lemmy, the Training Titan. 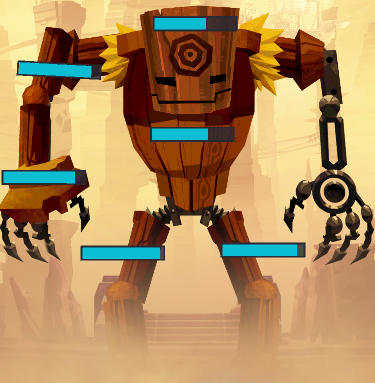 This big fella will be available for you to test out your new raid skills and will be useful for theory-crafting powerful skill synergies and combos. 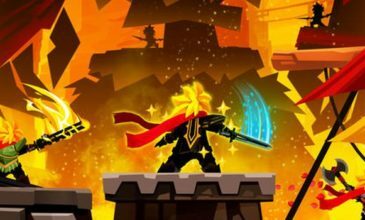 Check it out here while the Sword Master uses the Moon Beam raid skill – When Moon Beam activates it deals more damage against the Titan Lord’s torso! A skilled player will use this to focus their attacks to deal as much damage as they can… I wonder what other raid skills could work well with it? Keep watching for more devlogs and more reveals!